Disclosure: I was sent these items to review free of charge from Pack-n-Go Girls as part of the Multicultural Kids Product Promotion Services. All opinions in this post are my own. I did not receive any other compensation for this review. Every night Hazel and I enjoy reading some stories. Lately she reads one to my parents over the phone and then I read a few picture books to her and then we read a chapter or two from a chapter book. She is very into the Rainbow Magic series, but this past week we also enjoyed reading Mystery of the Golden Temple by Lisa Travis. This book is in a series of books by Pack-n-Go Girls. This is the first book set in Thailand. They have books set is Austria and Mexico and are hoping to come out with a new one this fall set in Brazil. They are also hoping to come out with Pack-n-Go Girls dolls. To do this, they need people's help. Please consider donating something to this kickstarter campaign. It will be open through June 25, 2015. They are almost at their goal, so go help them make it! 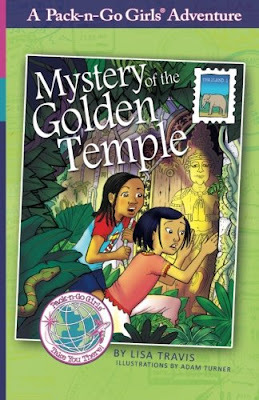 In Mystery of the Golden Temple, a girl from Boston, Jess, goes to Thailand with her family. Her mother has been working with a mother there. Jess quickly becomes friends with Thai girl, Nong May. While there mothers are working, the girls begin to unravel a mystery that may change Nong May's family's streak of bad luck around. Throughout the story Jess deals with cultural differences and learns and/or demonstrates how to behave properly in another country. There are so many lessons about traveling as well as about the Thai culture built into the story. Readers do not even realize the book is educational though as it is just fun and when finishing a chapter the reader wants to read the next one. I was begged many a night for another chapter and I must admit I found it hard to say no most nights. Then on their website Pack-n-Go Girls provides even more about Thailand including pictures of some of the places visited in the story and some of the dishes eaten. There are even some links to learn Thai and more about Thailand as well as get tips for traveling to Thailand with kids! The main characters in this book are very well developed. In fact the Pack-n-Go website offers biographies on them. They are nine-years-old and Jess loves to play soccer. There are many connections kids can make with the characters. Both girls also have older brothers who hang out together at the elephant rescue center. The book is written for kids aged 6-9 and is a high second grade/low third grade reading level. It is a fun way to explore Thailand and its culture while solving a mystery. My biggest apprehension before reading the book was that it might be too scary for my sensitive child, but it was not. It was very appropriate and we did not find it any more scary than the Rainbow Magic series and possibly even less scary. We really enjoyed this book and hope to read more from the other countries and hope they get the support they need to continue this fun series. I hope you will consider supporting them! !